Map showing distribution of Bee-fly records in Sussex. Since Bee-fly Watch started in 2016 we have been sent lots of records - thanks to all who have contributed. Will we find even more in 2018? Evidence of a late spring in 2018? 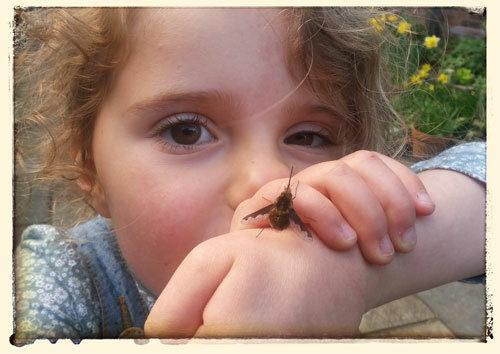 Spring time heralds in one of Britain’s cutest insects, the Dark-edged Bee-fly (Bombylius major). They are often mistaken for bumblebees, in what is suspected to be a case of Batesian mimicry (where a harmless organism has evolved to look like a potentially harmful organism, in this case the stinging bumblebee). Unlike bumblebees however, they have no sting, a single pair of wings (unlike the bees, which have two pairs) and don’t live in colonies. They do, however, spend much of their time buzzing around acting as jolly good pollinators, using their long proboscis to collect nectar from flowers. This proboscis has been known to alarm some who are unfamiliar with the species, causing concern that the fly is a type of mosquito or other biting fly capable of inflicting harm. There is no reason to worry though, the long mouthparts are used only for feeding and act much like the mouth of a butterfly, allowing them to reach into the deep nectar stores of flowers. The larvae of the bee flies are nest parasites of various solitary bee species. The adult female will collect small amounts of sand on the tip of her abdomen, which will be used to coat her soft, light eggs. She will then find a nest hole and ‘flick’ the sand-weighted egg into the nest, where the larva will hatch and feed upon the larvae of pupae of the solitary bee. The Dark-edged Bee-fly is the most common of the two Bombylius bee flies in Sussex, with the other species, the Dotted Bee-fly (Bombylius discolor) being less common and with more limited distribution. Dark-edged Bee-flies normally start to become active around March each year, with the first recorded sighting coming in on March 15th this year (later than the March 2nd record from last year!) They can often be seen in gardens or parks and are especially common in areas with ground-nesting solitary bee populations. Both are great species to go out looking for, especially the slightly rarer dotted Bee-fly! Since 2016 the recording scheme has run an annual Bee-fly Watch, encouraging people to look out for any of the spring bee-flies and send their records in. 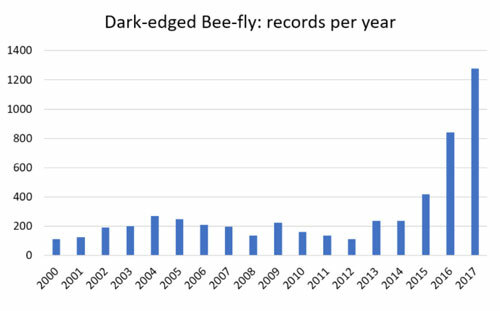 The project has been very successful in increasing the number of records - before 2016 the scheme received about 200 bee-fly records per year, but with a small amount of promotion via Facebook and Twitter we had over 800 records in 2016 and nearly 1,300 in 2017. This year records have been thin on the ground so far, with the cold weather in March, but bee-flies will be out and about as soon as it warms up a little. 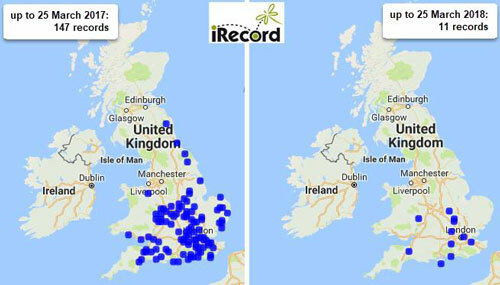 If you see one please do add the record to iRecord - last year there were quite a lot of records that were new for their 10km-square, and some signs of range expansion in Scotland, so there are still new discoveries to be made. For information on how to take part, and to download an identification guide, go to Bee-fly Watch on the recording scheme website. The scheme is also on Twitter and Facebook . There are only four members of the genus Bombylius native to the British Isles and of the two that are recorded in Sussex; the Dark-edged Bee-fly (B. major) is the commoner and more widely distributed of the two whereas B. discolor is be more coastally distributed and restricted to the far east of the county and the eastern Downs. One thing is certain we don’t have many Sussex records of either species, only 205 for B. discolor and 910 for B. major. Not only does the Soldierflies and Allies Recording Scheme , the organisers of “Bee-fly Watch” want your records, the SxBRC would also be very keen to have them too. 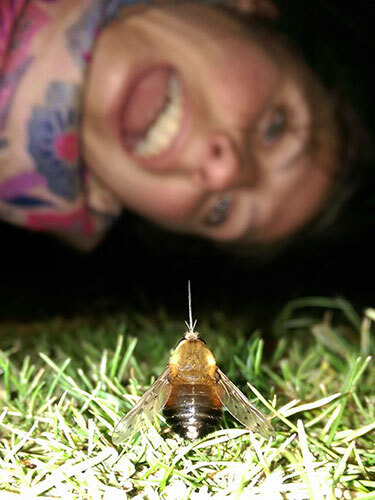 In order for both the SxBRC and Soldierflies and Allies Recording Scheme to get them, please submit any sightings of Bee-flies (ideally with a photo) via the iRecord website or mobile app.